Anthony Wilder Design/Build, Inc. is a high-end residential architecture-led design/build firm. 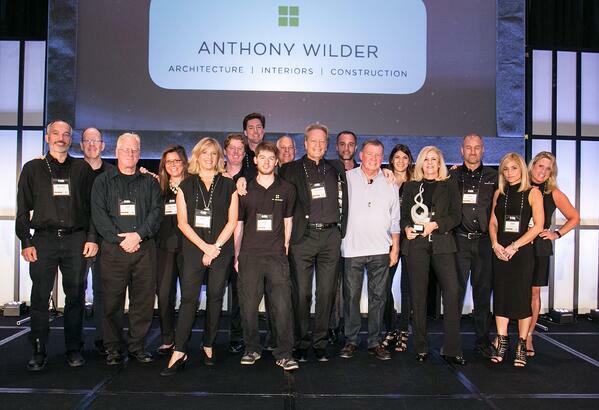 The Anthony Wilder team has been creating award-winning projects in and around the Washington DC metropolitan and tri-state area for more than 20 years. They took that commitment to another level in 2006, when they began playing the Great Game of Business. In fact, they played the game so well they were named an All-Star in 2009. The company was thriving, with a full-time staff of 30 people and annual revenues of about $7 million. And then the Great Recession hit. The housing and construction industries were devastated across the country. But Anthony Wilder survived. In fact, the company more than survived. While it did cut pay for employees, the firm kept their team intact and were well positioned to tackle projects as the economy turned around. Today, sales at the company – which continues to teach financial literacy to every employee – is projecting 15% year over year growth. But thanks to the collective wisdom of the team, the company is also expanding into new markets like interior design and home maintenance as ways to diversify and better prepare itself should another downturn roll around. With the recession in the rear view mirror, the team at Anthony Wilder has continued to elevate their gameplay across the board – particularly when it comes to their regular huddles and scoreboard updates. One of the areas they have invested resources in more recently is in the practice of High Involvement Planning. “I’m excited about how HIP will help chart our success, in terms of helping us identify what we need to do in the next three to six months to put us on target to hit our objectives over the next three to five years,” says Wilder. The team’s shared success has also led to another big step in the company’s evolution: on July 1, 2016, Anthony Wilder became an employee-owned business when the Wilders sold 27% of the business to their employees. Sharing ownership has been a long-term goal for the Wilders, who eventually plan to sell 100% of their company to employees.